It did rain today...but our local rainfall totals were disappointing to say the least across the southeastern plains. Listed below are some of the rainfall totals reported today across SE NM and nearby areas. 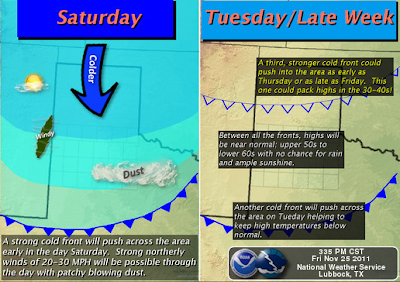 Mescal Raws - Near Mescalero .32"
5.0 Miles SSE of Carlsbad .24"
Smokey Bear Raws - Near Ruidoso .22"
NW Hobbs - KM5BS .05"
2.1 Miles NNW of Downtown Carlsbad .04"
A strong cold front will push south through the southeastern plains Saturday morning. Gusty northerly winds will accompany this frontal passage. Sustained speeds will be around 25-35 mph with gusts near 50 mph. A Wind Advisory has been issued for Lea County and surrounding counties in West Texas where the winds are forecast to be the strongest. 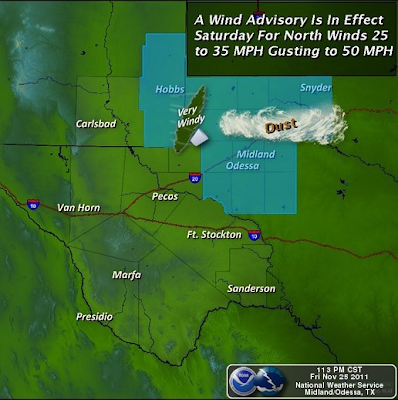 Areas of blowing dust will occur with the stronger wind gusts. 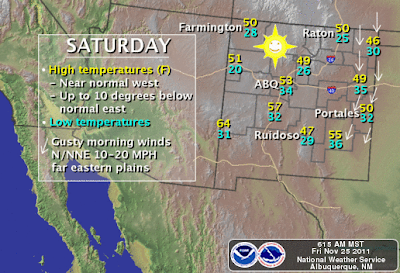 High temperatures on Saturday are forecast to be in the 50's. Sunday will see highs in the low 60's. Sunday morning will be seasonably cold with low temperatures in the low-mid 20's. 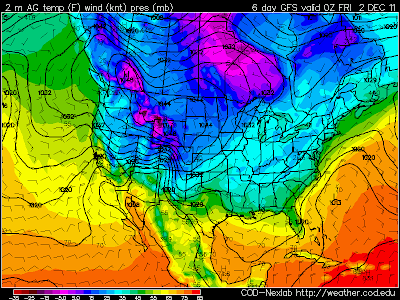 As always, a few of the normally colder spots will drop down a little lower, perhaps down to around 20. 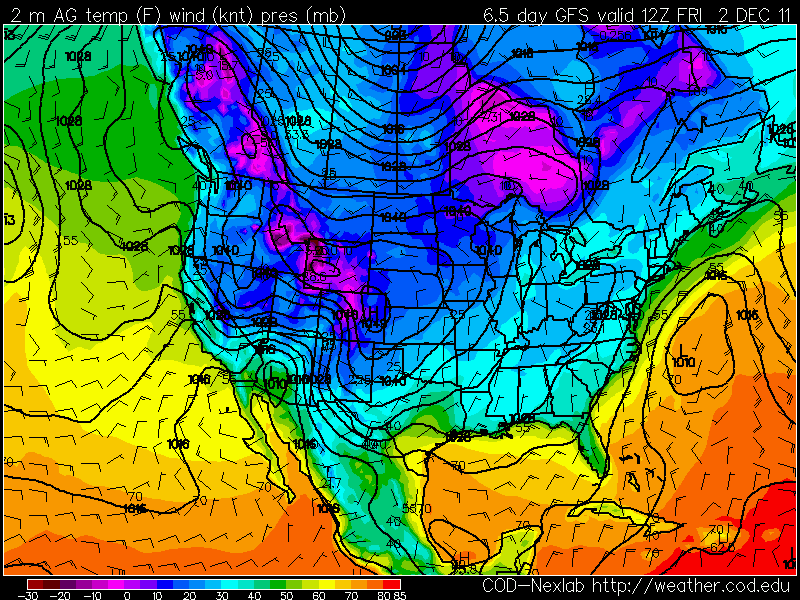 The upper teens in a few of these colder spots will also be possible. Next Week Is Going To Be Interesting. Monday will be warmer with afternoon highs in the low-mid 70's. A cold front will move into the area Monday night, therefore dropping our high temperatures on Tuesday back down into the mid 50's. 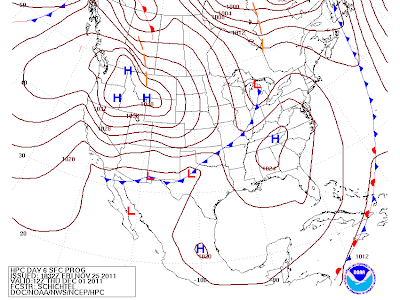 This will be a dry front so no precipitation is forecast with this system. Arctic Blast By The End Of The Week? 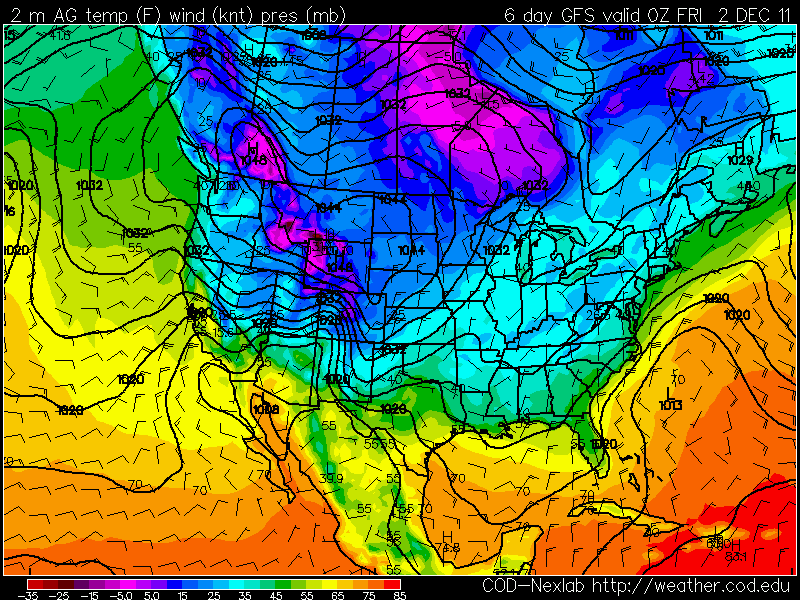 GFS Surface Temperature Forecast At 5 PM MST Thursday. 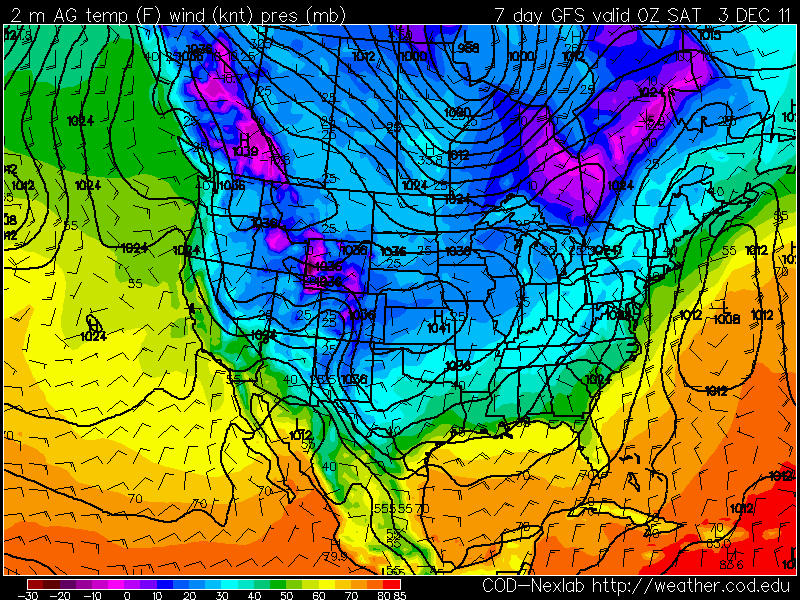 GFS Surface Temperature Forecast At 5 AM MST Friday. 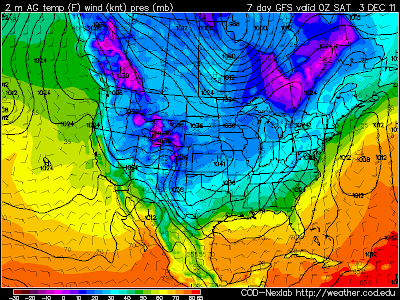 GFS Surface Temperatue Forecast At 5 PM MST Friday. 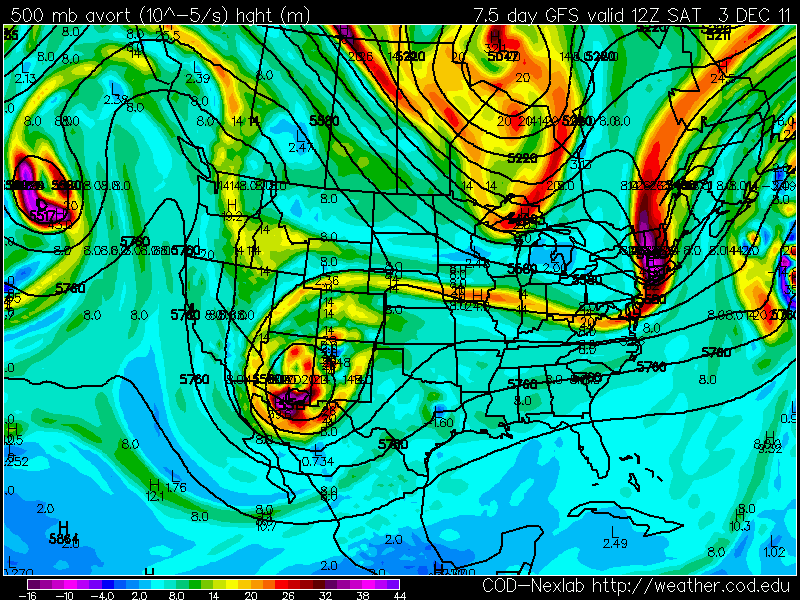 GFS 500 MB Heights/Vorticty Forecast At 5 AM MST Sat. 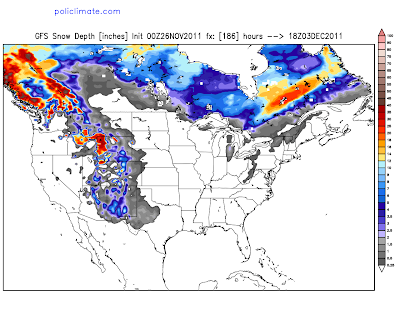 Tonight's GFS Snow Depth Forecast Map. 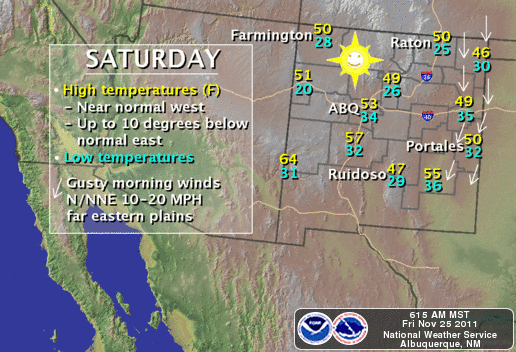 Valid At 11 AM MST Sat, Dec 3, 2011. A strong arctic cold front is forecast to enter SE NM by around next Thursday. Its early yet, so the exact timing of this frontal passage is questionable. 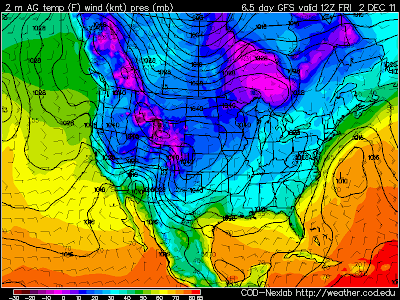 However, it appears that the coldest airmass of the season is about to give us our first taste of winter. Depending upon the timing of the arctic front, our high temperatures may not get out the 20's and 30's Thursday into Sunday. How about low temperatures during this time period in the teens or colder? 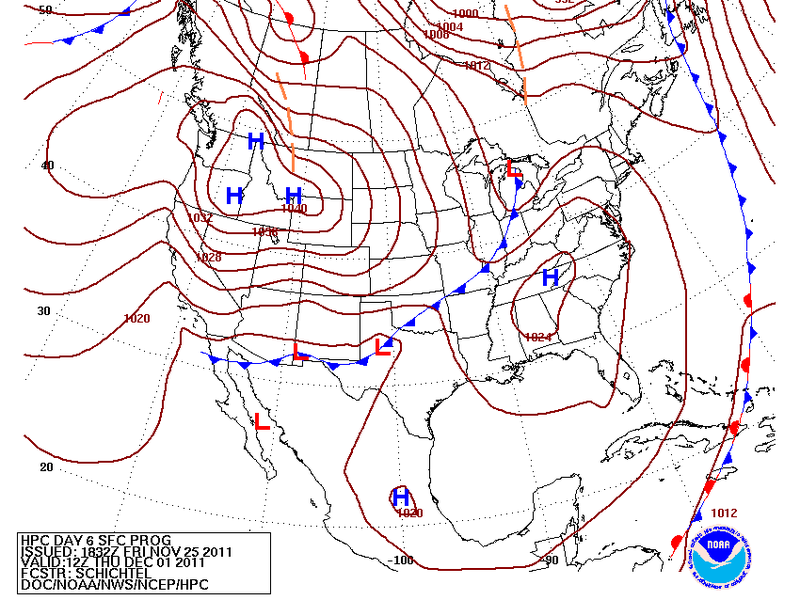 Get ready...its looking like this is going to be our first serious storm of the season. Tonight's 5 PM MST run of the US GFS forecast model, is forecasting a strong closed 500 millibar low to drop southward into the Four Corners by Thursday, and then slowly move eastward across southern New Mexico Friday into Sunday. And to make life really interesting, its forecasting a good low-level upslope flow situation, combined with a decent slug of moisture at the mid levels of the atmosphere. Liquid equivalent totals for the area are in the .25" to .50" range on Saturday. Translation, snow and maybe lots of it. All of this depends upon whether or not this model forecast verify's of course. Its more speculation than anything at this early stage in the game, but definitely worth watching. 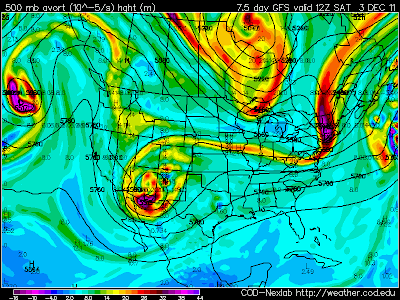 This potential storm could be a news maker for us, or it could just easily be a flop. If nothing else, we are more than likely to see the coldest airmass of the season invade us by the end of this week into the weekend.